Just the day after the horrific incident took place, where a man was seen walking with his wife’s body carrying over his shoulder, another such incident has emerged from Odisha. At a hospital in Balasore, a sweeper is seen standing over a dead body, presses it down and breaks the bones to make it compact. Two workers are then seen wrapping the crumpled body in cloth and plastic, and slinging it to bamboo to carry it. There are no ambulances available to take the body from Soro to Balasore. There are no hospitals in Soro, and bodies have to be taken to Balasore by train for Post- Mortem. The body was taken by the police to the health center, where it lay for hours on a stretcher and became stiff. Apparently, to make it easier to tie up the body and carry it, a worker broke it at the hip and carried it to the railway station about 2 km away. After learning of the case, the Odisha Human Rights Commission has asked for an explanation from the police and Balasore district authorities. 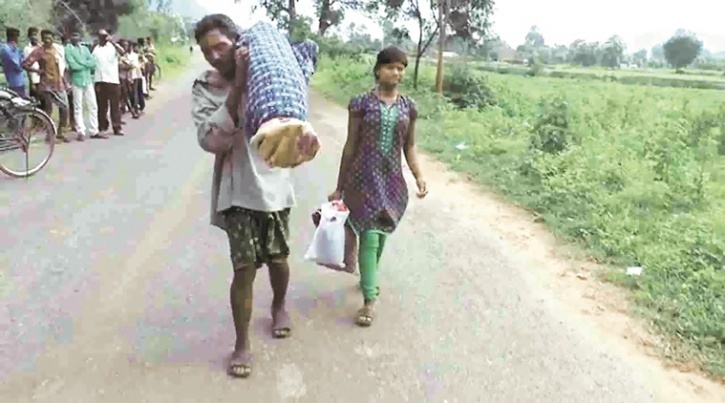 Yesterday only, Odisha faces criticism over a man in Kalahandi, Dana Majhi, being forced to walk with his wife’s body, his daughter by his side, for six hours.